VSS Unity, the second SpaceShipTwo vehicle, is carried aloft by its WhiteKnightTwo carrier aircraft, Sept. 8. Its first glide flight is scheduled for Nov. 1. Update: Virgin Galactic has postponed the glide test portion of today's flight due to strong winds. The VSS Unity has landed safely, and the company plans to announce a new test date soon. The space tourism company Virgin Galactic took to the air with its VSS Unity space plane today (Nov. 1) to attempt the craft's first glide flight. 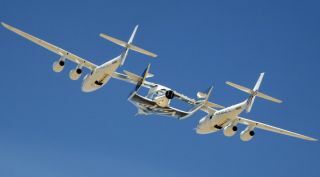 Virgin Galactic representatives announced the test this morning. If weather permits, the SpaceShipTwo VSS Unity will be carried to drop altitude by its mothership, called the VMS EVE, and then released so that it can glide back to Earth and make a runway landing at the Mojave Air and Space Port in California. The VMS Eve took off at about 10:35 a.m. EDT (7:35 a.m. PDT/1435 GMT) from the Mojave spaceport. Today's test flight will not go into space, but it is a major step in Virgin Galactic's flight test program to resume rocket-powered flights. Virgin Galactic has not performed a free-flight test of a SpaceShipTwo since its first vehicle, the VSS Enterprise broke apart during a powered test flight on Oct. 31, 2014, killing a co-pilot and injuring its pilot. These are the milestones that the private space tourism company Virgin Galactic plans to hit before taking paying customers on suborbital flights into space. In September, Virgin Galactic performed the first captive-carry test flight of VSS Unity attached to its mothership. That flight set the stage for today's drop test, company representatives said. "Our first glide flight will be focused on testing the fundamental performance and handling qualities of VSS Unity," Virgin Galactic representatives wrote in a statement. "For this first test, we will keep the vehicle at a light weight and will place a 'speed limit' on the pilots (Mach 0.6). Once we analyze the results from this test, we will be cleared to go faster on subsequent tests." The test is also weather dependent. It's possible that Virgin Galactic may call of the drop if weather conditions prove uncertain. Virgin Galactic's SpaceShipTwo is a two-pilot, six-passenger spacecraft designed to carry space tourists on roundtrips to suborbital space. The spacecraft is designed to be carried up to a high altitude by its carrier craft VMS Eve and then be released so it can ignite a rocket motor and launch into space. The spacecraft won't reach orbit, but will provide passengers several minutes of weightless and views of Earth from space via its many windows. Virgin Galactic is selling tickets for the experience at $250,000 per seat.